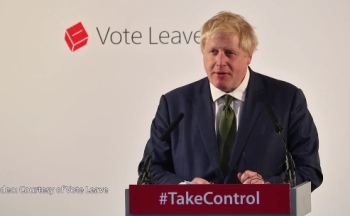 Boris Johnson made an important speech today making it clear why we should take back control from the EU. He said that the Prime Minister’s renegotiation had not changed our relationship with the EU, and that it proved that Brussels is incapable of reform He also called on the Government to stop its ‘campaign of subterfuge’, to conceal the scale of constitutional changes involved if we voted to stay in the EU. He addressed the premise that Britain would fail economically outside the EU, and said that it was an ‘absurd’ concept that Britain has no power to conduct its own trade negotiations and do deals with fast growing economies around the world. He highlighted the fact that the Single Market has not delivered what was promised and pointed out that from 1992 to 2011, there were 27 non-EU countries whose exports of goods to the rest of the EU grew faster than the UK’s. He also reflected concerns about the undemocratic behaviour of the EU, stating: ‘We cannot change the EU’s direction. We cannot change the pace. We cannot interrupt the steady erosion of democracy”. Click here to hear the full text of Boris's speech. The In campaign wants us to stay in an EU that is unreformed and going in the wrong direction. Staying in the EU means handing over more money and more control to Brussels. It means even greater pressure on our public services through increased migration. That is why it is the safer choice to Vote Leave on 23 June.